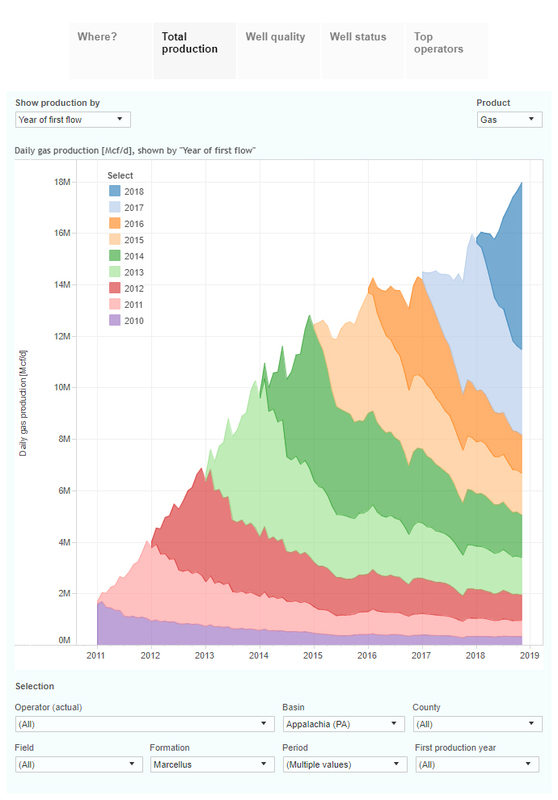 This interactive presentation contains the latest gas (and a little oil) production data, from all 8,639 horizontal wells in Pennsylvania that started producing since 2010, through November. November gas production showed another big gain, as more than 0.3 Bcf/d was added. Total gas production for the month was 18 Bcf/d, 16% higher than a year ago. The 759 wells that started production in 2018 contributed 6.5 Bcf/d to the November numbers, or 36%. This is typically a far higher percentage in the oil basins, as you can see in our other posts, which is mostly caused by a steeper decline of oil versus gas. The production profiles of all these wells can be found in the 2nd tab (‘Well quality’). By default, they are averaged by the year in which the wells started production. 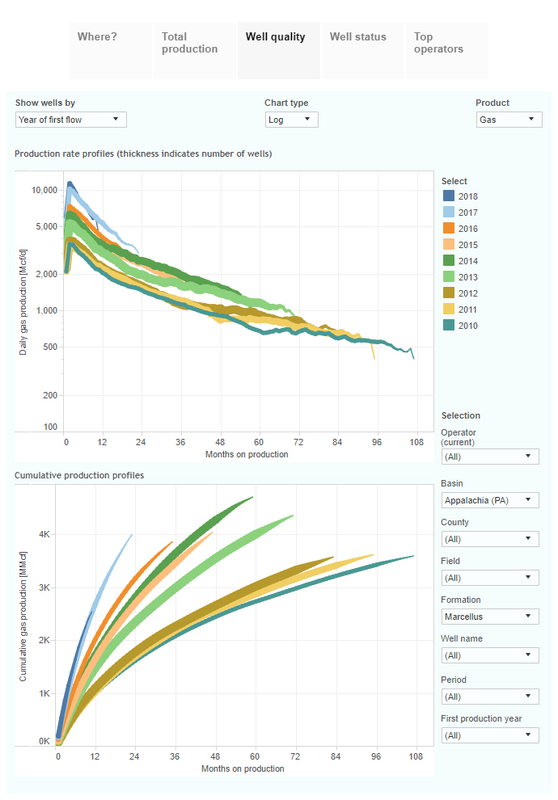 The bottom plot shows the cumulative production versus time graphs, and they clearly reveal how each year well productivity improved. One main driver has been the increase in reservoir stimulation; wells in 2018 were completed with almost 17 million pounds of proppant, on average, while this was only 4 million pounds six years earlier. The 2 largest gas operators, Cabot and Chesapeake, both increased their output in November, as you’ll find in the final tab (‘Top operators’). Cabot almost exclusively operates in Susquehanna County, where the best well results can be found. There it is responsible for over 60% of the gas produced. 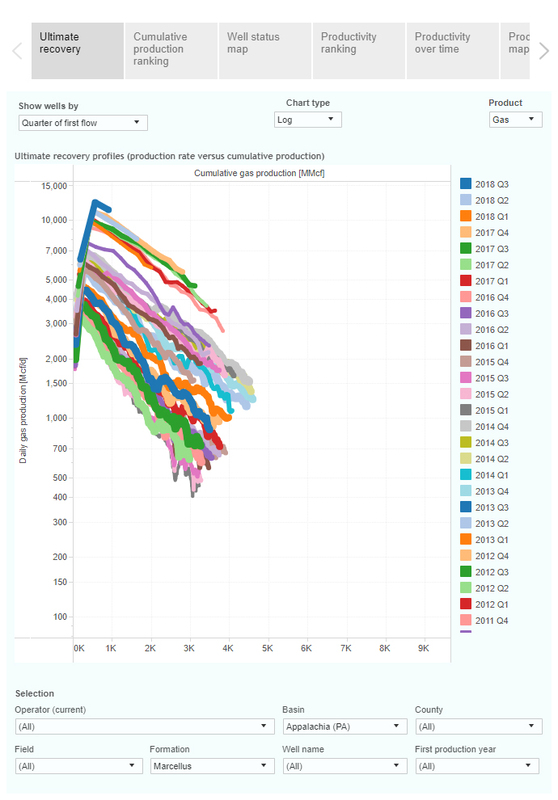 This “Ultimate Return” overview shows the relationship between gas production rates and cumulative gas production, averaged for all horizontal wells that came online in a certain quarter. The 348 wells that started in Q4 2013 have each recovered 4.6 Bcf of natural gas, and they are still producing at 1.3 MMcf/d, on average. Newer wells appear so far to be on a trajectory to do well above those numbers. That well productivity has rapidly grown over time is also visible in the 5th tab (‘Productivity over time’). The average cumulative production in the first 2 years is plotted there, and based on this metric performance doubled in just a couple of years. Early next week we’ll be back with a post on the Niobrara. If you don’t like to wait to get access to the latest data, I have good news for you. In just 1 or 2 weeks, we’ll be launching a new subscription level (‘Basic’), for which you can get access to our analytics platform for a very low fee ($52 per user / month). No need to install anything, full-screen dashboards, maps with all individual horizontal wells plotted, more filtering options and much more. We’ll be in Houston in the 2nd week of February, for the NAPE summit. Come visit our booth, or contact us if you like to meet us during that week.